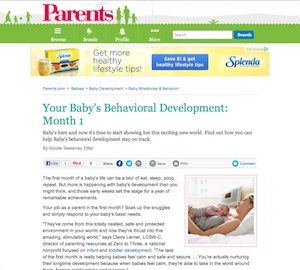 In an effort to bolster content in its babies section, Parents.com approached me about writing a 24-story series on behavioral and social development in each of the first 12 months of an infant’s life. Considering my youngest was under a year at the time, I loved having the excuse to quiz various child development experts and came away with a slew of terrific tips. Read a sample from the series.